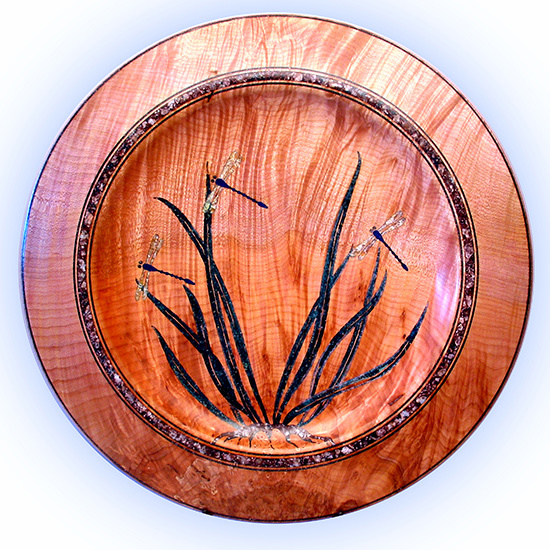 Materials: Flame-figured bigleaf maple with inlaid minerals. Finished with aniline dyes and tung oil. Comment: This is the first wetlands-themed platter I made. Inspired by the Washington state official insect, the common green darner dragonfly, which arrive in large groups (fetches) in the spring. Acquired by a private collector through The Real Mother Goose Gallery, Portland, OR.